As a discipline, social work needs an inclusive metatheory for both research and practice that goes beyond positivism and constructivism. 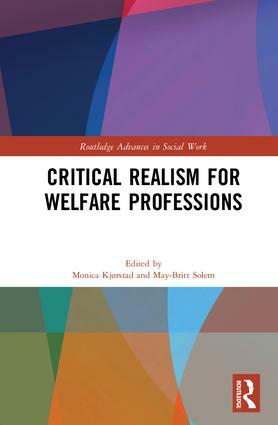 This is the first book to present and discuss how critical realism can contribute to a more useful and realistic approach to both research and practice in social work. As a theory of science that includes normative theories and emphasises method-pluralism and holistic thinking, critical realism is applicable to a world of poverty, global health problems and social conflicts. Contributors to this book present a realist perspective on social work. The connection between critical realism and social work is illuminated through a theoretical introduction in Part 1. Part 2 covers the specific topics of normativity, interdisciplinarity and education. Part 3 presents practical/empirical examples from contemporary research in social work, using different approaches based on critical realism. As critical realism can contribute to a useful and realistic approach to research and practice, this book is essential reading for professionals, academics and students working in different fields of social work and health care. Monica Kjørstad is Associate Professor in Social Work at the Faculty of Social Sciences at Oslo and Akershus University College of Applied Sciences. Her interests are social administration and planning, leadership and implementation issues connected to social work, welfare and human rights. She holds a PhD in social work and social policy. May-Britt Solem is Associate Professor in Social Work at the Faculty of Social Sciences at Oslo and Akershus University College of Applied Sciences. She has constructed and now coordinates the Master Program in Family Therapy. Her current research is a longitudinal study of parenting practices and stress and sons' transitions to adulthood. She holds a PhD in psychology.